Our friend and monarch caterpillar guide, Andrea Golden, was going on vacation and needed some caterpillar sitting. She had a group of monarch eggs and baby caterpillars that she brought in from her yard, and was raising in terrariums. We offered to become the foster parents and took the group home, with Andrea’s advice in mind and her handwritten instructions in hand. Andrea tells us that only about 2% of monarch eggs survive in the wild, so hand raising them is helpful to this threatened species. We brought them home and set up the nursery on the back porch. And also started setting up timelapse sequences to record their progress. After a number of tries we got a video of the birth of a caterpillar. Since Andrea taught us what the teeny eggs look like, and where to find them, we found some of our own at Mary Cummings Park, and brought them to the nursery to hatch in safety. One suspects that a monarch egg, not yet tainted by the milkweed poison, must be a real tasty find for other insects, birds, and other critters. Now we are raising another crop of babies from Andrea, along with some we found at the park. So this year we will have released 8 monarchs back into Mary Cummings Park, a great insecticide-free haven. 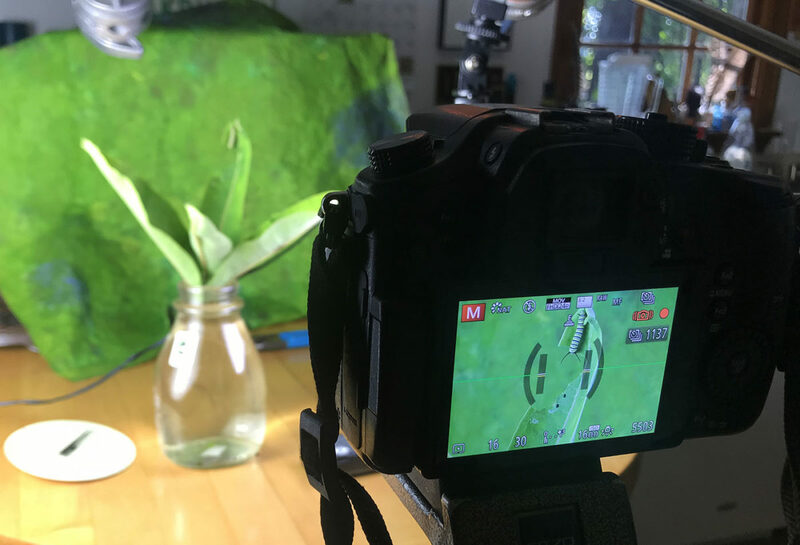 And along the way we gathered tens of thousands of frames of timelapse video which will soon emerge from their own chrysalis as a complete lifecycle video of the magnificent monarch butterfly.